When your wheels are aligned with Bee Line equipment, you save thousands of dollars by extending the life of your fleet’s tires. Maintaining properly aligned vehicles helps keep money in your pocket. Although wheel alignment is often overlooked in preventive maintenance programs, more importance is being placed on the cost savings and handling characteristics of routine complete alignments. 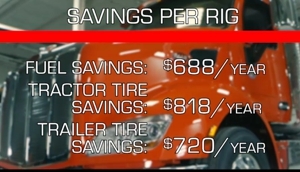 Fleet executives are putting more emphasis on maintaining skilled drivers by performing computerized alignments, which create considerable fuel and tire savings while improving drivability. To achieve maximum truck efficiency, Bee Line promotes measuring and correcting ALL major alignment angles, thus providing a complete solution in Total Vehicle Wheel Alignment. Align your fleet for laser accurate performance and reduce your operating costs today. What is my savings potential? Just 1/8” excessive toe can reduce tire life by 25%! Fighting to reduce operating cost is something you live with every day. OEMs have incorporated aerodynamic designs, more efficient engines and drive trains. Fleets have increased the focus on preventative maintenance programs, but one thing you may have overlooked is the importance of proper wheel alignment. A spokesperson for a major tire manufacturer reports that 1/8” excessive toe error produces 8' of side slippage per mile, which can result in a reduction of tire life by as much as 25%. It has been proven that proper wheel and axle alignment can save the average fleet significantly in reduced tire wear and improved fuel economy - reducing operating costs over $1,000 per unit/per year* Calculate YOUR fleet's savings potential now! *Based on a fleet of 50 tractors logging 100,000 miles per year. Align your fleet for laser accurate performance and reduce your operating costs today. When it comes to the alignment on your trucks, “close enough” can cost you a lot of money. Alignment is extremely important from a tire-cost perspective. With the rising costs facing Fleets today, it is unquestionably important to take advantage of every savings opportunity. If the truck isn’t properly aligned, fuel economy will suffer right along with tire life. In fact, the two are interrelated. Where do you think the energy needed to scrub that rubber off your tires comes from? Right out of your fuel tank. If you are experiencing irregular tire wear due to misalignment, fuel economy is suffering too. Performing more frequent alignments provides better control over vehicle condition and extends the life of the tires. A spokesperson for a major tire manufacturer reports that 1/8” excessive toe error produces 8'of side slippage per mile, which can result in a reduction of tire life by as much as 25%. When does it make sense for your fleet to acquire and operate your own alignment equipment? Vehicle alignment is often cited as a luxury maintenance item. It's known that proper alignment reduces certain types of tire wear and can improve fuel economy. The problem is, alignment is often not performed unless there's an obvious need for it. Cost is often cited as a barrier to more frequent alignments, as is the inconvenience of sending the truck out to have the work done. The alignment itself takes almost no time at all, but you can tie up a truck and a driver for hours getting the truck to an alignment shop. The number of vehicles in the fleet helps to determine if it makes sense to bring the work in-house where it can be performed more conveniently and more frequently, ultimately controlling costs and lowering total cost of ownership. Another advantage to having your own alignment equipment is the upon-delivery inspection. Alignment should be checked when the truck is delivered, not at the first PM. If it’s not right when it’s brand new, it’s not going to be later on. It may be several months into the life of the vehicle when tire wear issues and driver handling complaints begin to manifest themselves. By then, it's too late. The OE likely won't honor the alignment warranty even though it may have not been correct in the first place. With a dedicated alignment program, and one that is adhered to, it is possible to save tens of thousands of dollars per vehicle, per year, and this does not include the other benefits which include improved handling and safety. See how a fleet can reduce operating costs by performing alignments in-house.